With Wonda VR you can import spatial audio in .tbe format. To know more about this format, please visit the official Facebook 360 Spatial Audio website. A .tbe file needs to be associated with an existing media (either an existing video or stereo audio) of your media library. The .tbe file will be copied automatically to the Media > Audios folder of your project. 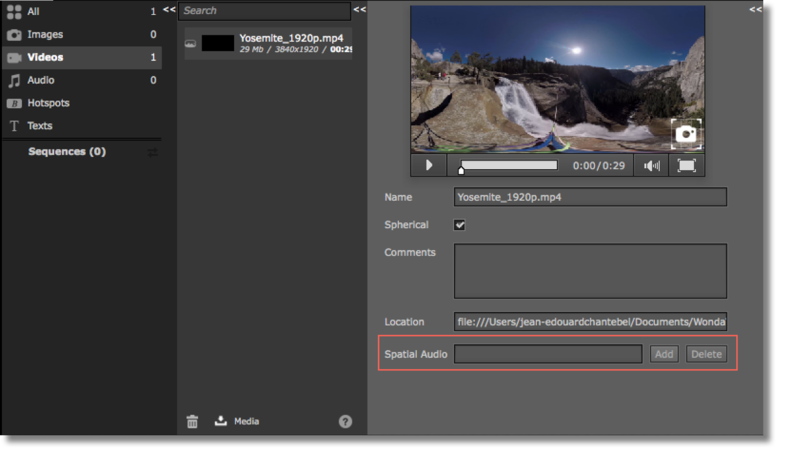 In case of a video, you can only adjust the audio volume in the sequence editor. In case of an audio, you can adjust the volume, set a loop or a continuous audio. In both cases the stereo audio stream from the original media will be replaced by the spatial audio and will not play back. NB: Spatial audio is only supported in the Android mobile app in offline mode and the Oculus Go. Neither the iOS app, the editor nor the web player can playback the .tbe audio stream. In this case, the stereo audio stream of the original media will be used as a fall back audio.